You know… I write about cakes all the time. 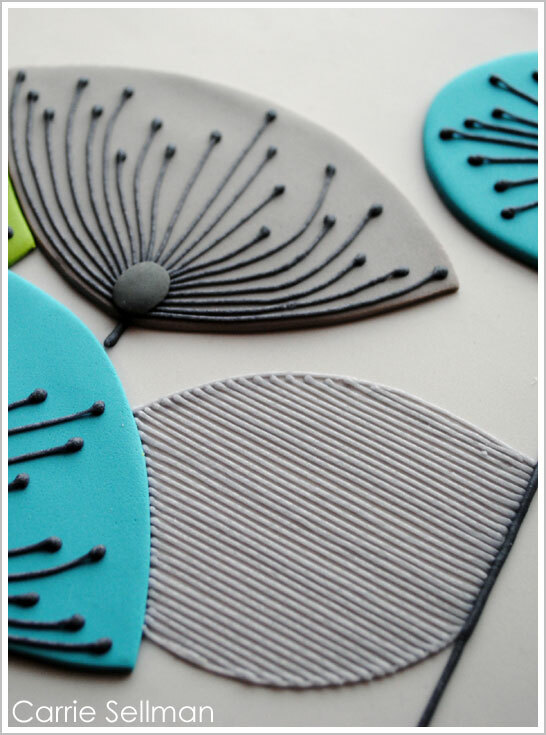 Each day I feature cake designs that I adore, which were created by others. 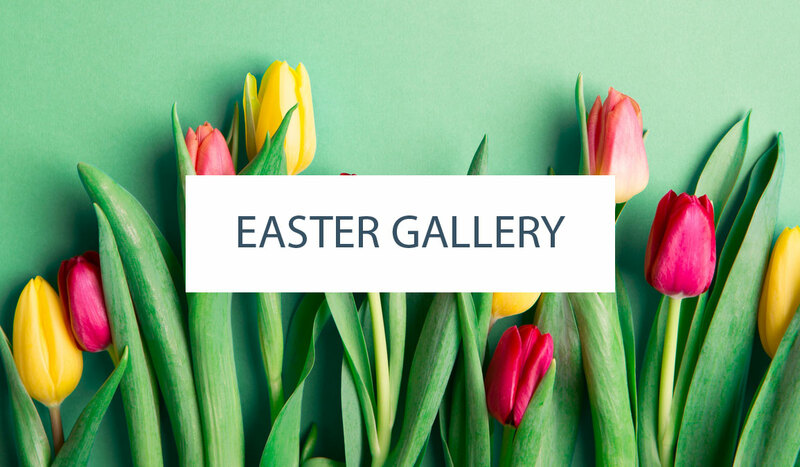 It is my privilege to post their images and share their talent for everyone to enjoy. Normally, my write ups come easily as I oohhh and awe over the details and techniques used…. fully appreciating the time, skill and effort involved in each and every creation. 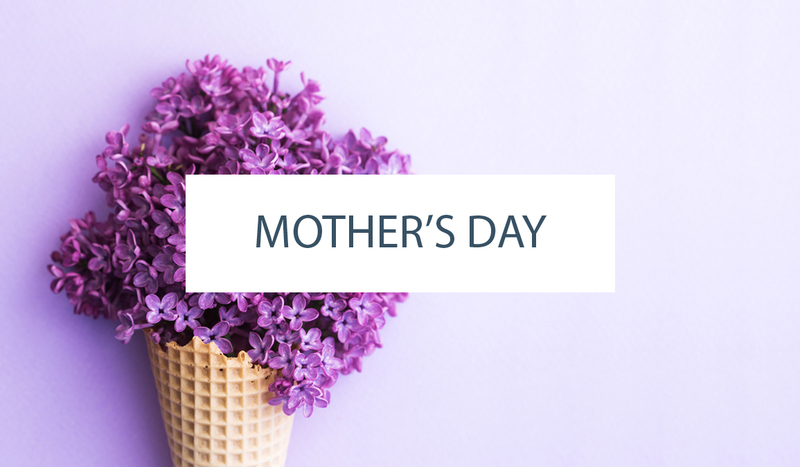 But when it comes to today’s post, it’s harder to find the right words. Most of you probably realize that I’m a little obsessed with cake! What you may not know is that I used to own a specialty cake shop of my own. It has been almost four years now since my family relocated and I stopped accepting orders… which was kind of a hard thing for me. But I’m loving the blog life now and wouldn’t trade it for anything. I still get my fill of cake and get to be a full time mommy to my 11 month old daughter. It’s actually much easier on the waistline too!! And every now and then, I have the opportunity to design something new and put my skills to the test. This post has been a long time coming and I’ve been dying to share it with you! But I wanted to see it with my own eyes first! And it’s finally here, in print!! I am tremendously honored to be included in BRIDES Magazine’s America’s Most Beautiful Cakes for 2011!! I could not be more flattered and humbled to be included with some of my favorite cake icons of all time, like Elisa Strauss of Confetti Cakes and cake experts, Kerry Vincent and Colette Peters . Not to mention some of my new favorite talents like Erica O’Brien and Eat Cake Be Merry. Really?!? Can someone pinch me please? It’s been a year long process but that’s my cake in the back row! BRIDES contacted me back in January and invited me to submit some design ideas. I, along with numerous other cake designers, submitted our best and most original ideas. Then came a request to submit an example of my sugar work, showing the techniques and colors to be used. Finally came the invitation to actually create the cake for a photo shoot in NYC! I so wanted to deliver my cake to the shoot in person, but it just wasn’t possible. Many props to the FedEx man for delivering the cake safely on my behalf! Talk about nerve racking!! Okay, so enough of the back story… here are some of my photos of my Retro Cafe Flowers design. 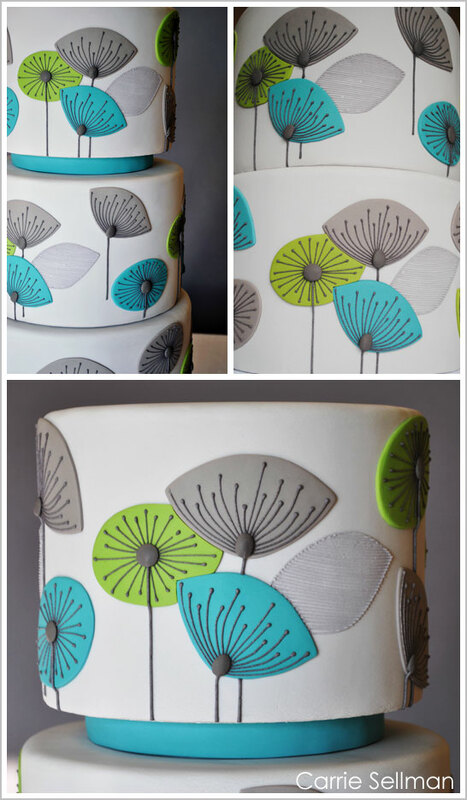 Inspired by this retro Dandelion Clocks Wallpaper, my design features three extra tall tiers covered in light grey fondant. 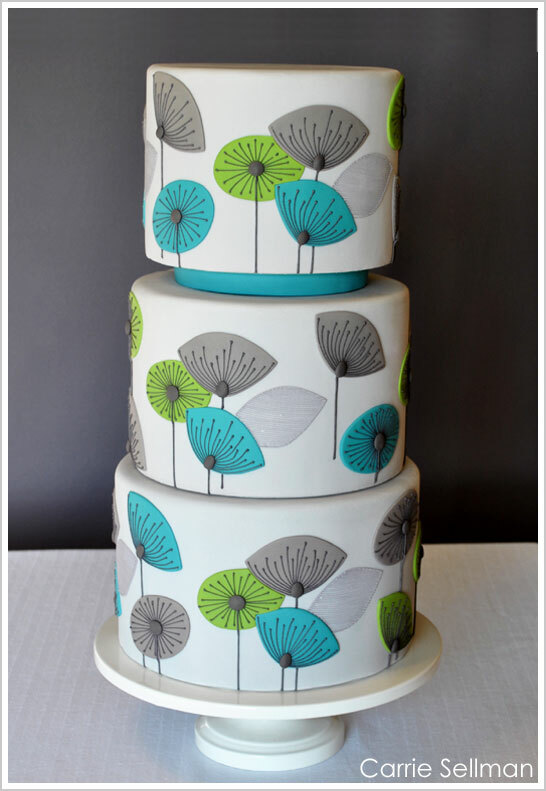 Hand-cut fondant flowers in turquoise and bright green recreate the wallpaper pattern. The flower details and intricately striped leaves are hand-piped using a sugar glaze and a short turquoise spacer adds an extra pop of color. Thanks so much to the editors at BRIDES for this amazing opportunity! I could not be more thrilled to be a part of this feature! Thanks to the many, many cake designers who allow me to showcase their work every day on Half Baked. You provide us all with such great cake inspiration and this process reminds me all too well of the time and effort involved in every one of your creations! And a huge thanks to all of you, for allowing me to share a bit of my work with you today. 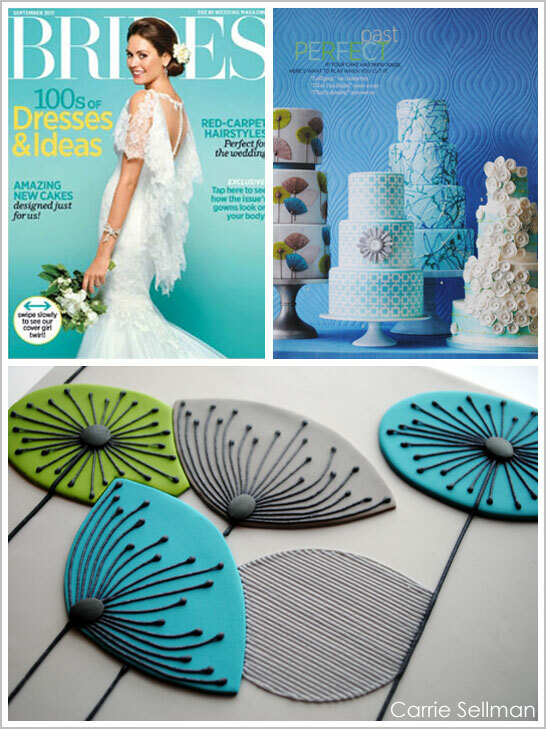 Be sure to pick up a copy of the September issue of BRIDES Magazine to see all of the amazing designs included in the 2011 America’s Most Beautiful Cakes feature! Stay tuned for some additional photos and behind the scene video coming to brides.com and the BRIDES iPad App! This is fantastic!!!! Congrats! Now I want to see all the other fabulous cakes you have done. Wow, I can only imagine how exciting this is for you! CONGRATULATIONS! I cannot believe the piping on those leaves. I think my hands would fall off if I attempted that. Awesome job, congrats again. Absolutely beautiful cake. Love it Carrie! Loved it even before I knew it was yours. Congratulations. Wow ! Thats amazing 😀 Congrats ! How on earth did you make the grey leave-piping so even ?! Holy cow!!!!!! Precise!! Perfection!!! I am in awe!! Such a GORGEOUS cake! I didnt realize the leaves were hand piped, I thought it was drawn on with an edible marker. Such a beautiful intricate design! cant wait to go grab the magazine! Oh. My. Goodness. That is incredible- so stunning a design. Many many congratulations for your well deserved feature in the magazine! The cake looks amazing, but I knew it would!!!! 🙂 Congrats!! Can’t wait to get my copy of the magazine!! WOW! the piping on the silver leaf/flower petal is amazing!! !…how i hope to one day be as flawless! Your cake is really stunning. Congratulations. Congratulations, that is a stunning cake!!!! You have some amazing skills. Great cake,Carrie! Congrats, we’re very proud of you! Stunning Carrie! You are so talented and you deserve it!! CONGRATS! What an amazing cake and a huge honor to be featured in Brides magazine! You should be so proud of your talent! I love so many things about this cake…the colors, the design inspiration and the serious precision in all the piping. I can’t even imagine how much time you spent on this work of art! I am in awe that you shipped the cake and it arrived safely! Definitely one of my favorite cakes of all time! And I’ve already gone out and bought my own copy of the magazine! Stunning design – I love the color combination!! Congrats on being featured in such a beautiful magazine!!! Absolutely WOW!!! The cake is GORGEOUS!! And it SO deserves to be in BRIDES magazine! You are so talented and I just adore you! I’m so happy for you!! Congrats!! You are so talented! I would be on could 9 for years to come if I were you! This is such great news Carrie! Congratulations!! Your cake is incredible! AHHHH!!!! CARRIE!!! I am so so so so excited and proud of you! What an amazing moment and accomplishment! Congrats to you! Congratulations! That cake is amazingly gorgeous! It would be so painful to cut into it. Such a gorgeous cake! Well deserved praise!